Type 79 submachine gun was designed in PR China during 1970s as a lightweight weapon for jungle warfare. It was type-classified in 1978, and manufactured between 1981 and 1992. However, it failed in its intended role due to insufficient reliability under harsh conditions, and most Type 79 submachine guns ended being issued to Chinese People’s Armed Police. Chinese Police still uses Type 79 submachine guns in significant quantities, with many guns being upgraded with various ‘modernisation kits’ that usually include new forend with Picatiny railsm used to mount Red Dot sights, flashlingts, lasers and other acessories. 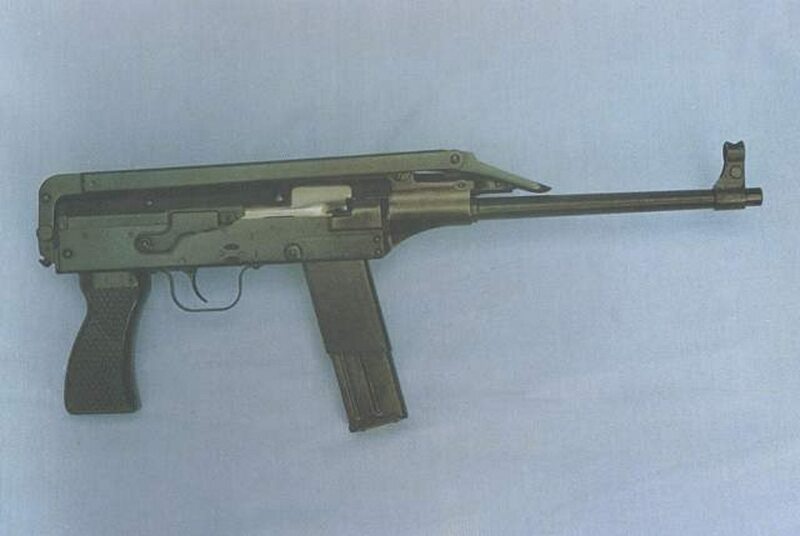 Type 79 submachine gun uses gas operated, rotary bolt action with short stroke gas piston, located above the barrel. Bolt group is more or less an adaptation of the Type 56 (AK) assault rifle, with similar bolt carrier (less gas piston) and a rotary bolt with two locking lugs. Receiver is made from steel stampings. Fire mode selector / safety switch is also patterned after Type 56 assault rifle, and allows for single shots and full automatic fire. Type 79 fires from closed bolt and uses conventional hammer-fired mechanism. Box magazines hold only 20 rounds of ammunition. Shoulder stock is made from stamped steel and folds up and forward when not in use.